Its been a very long time since I took a bus on an overnight journey. With the University exam season setting in, began the most busiest season for us teachers. With the beginning of June, came the orders for being an external examiner for the university practical examinations. Two of the three postings that I had were "local" (within 200 kms) - I'd write about them later. The longest of my postings, was at Mangalore. The exam was on a Monday, and hence I delayed booking my tickets for quite some time. I wanted to try out the Mangalore operators, and not repeat a KSRTC or a VRL. After lots of confusions and tie-breakers, I opted for Durgamba. I booked the ticket only a day before journey, since the bus remained empty most of the time. 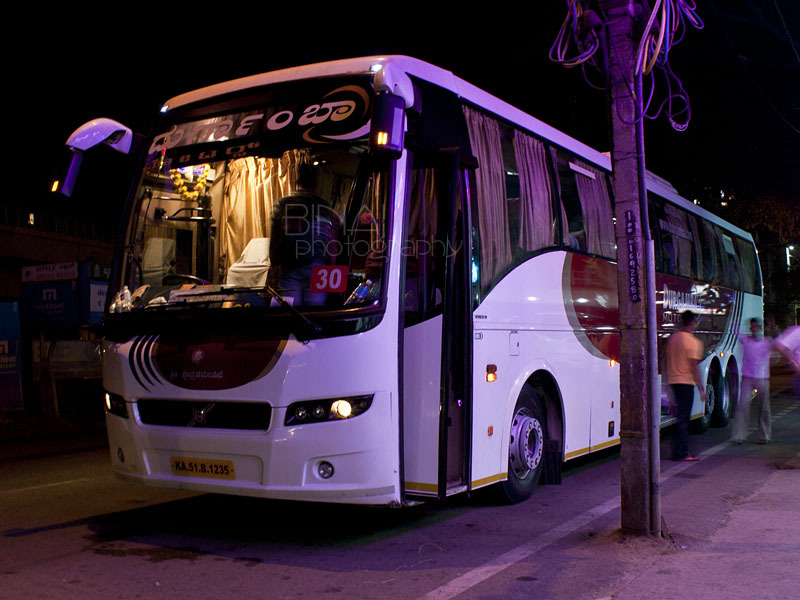 Durgamba had two Volvo services out of Bangalore, towards Mangalore. Due to some official commitments, it wasn't possible for me to leave until late, and hence opted for the last bus of the day. I was in office till late in the evening, due to examination work. I reached home quite late, and had very little time to pack and leave towards my pick-up point. I booked an Uber cab - which turned up perfectly on time at my home. The driver was new to my area, and struggled a bit till we reached the main road. He made quick progress after that - the roads were fairly clear, except for slow moving traffic around Majestic area. I was at the pick-up point, along Platform road near Majestic, at 2230hrs. The first Volvo bus of Durgamba was about to depart from there. Just after the bus left, my bus came in - at 2233hrs, for a 2245hrs. The bus that would take me to Mangalore was KA-51-B-1235. The bus was kept in great shape - absolutely no scratches or damages on the bus. The guy at the door checked my ticket - the printout was very light, and not very clear. He quickly got me another print from the office. I really liked that! I've often seen bus crew picking up fights with passengers over printouts being light - this person went out of the way to get me a new printout! I got into the bus with the new printout - the bus was clean inside out. Although the bus seemed empty when booking my ticket, the bus was actually fairly occupied. Boarding was completed, and we started moving from there at 2242hrs - three minutes before scheduled time. I really liked the way they maintained time - quite unlike their counterparts on other routes. The bus took off towards Old Mysore Road, and then to Vatal Nagaraj Road. The driver was very slow in the beginning - lugging the bus at times. We had another pick-up at Rajaji Nagar - the bus filled up here, with just about a handful of seats empty. We started from Rajaji nagar at 1056hrs. We moved towards Yeshwantpur and then took the elevated highway from Goreguntepalya. The driver was lugging the engine badly at the beginning, but once past the Tumkur Road toll gate, he picked pace. I was too tired from the long day I had in office, plus continuous exams over the previous week, I slept very quickly. It was one long, nice, uninterrupted sleep. I slept till about 0515hrs - woke up just as we were leaving from BC Road, after a drop (Identified the location using Google Maps). I slept for some more time, before being woken by the crew with their continuous calls for passengers alighting at Kankanadi. The attendant made a very typical styled announcement - he kept continuously calling for passengers for about 2-3 minutes, instead of making just one call. We passed Kankanadi at 0548hrs. Since I was in Mangalore after a long time, and actually staying in Mangalore for the first time, I had absolutely no idea of where to get off. I did have a gross idea about the location of my hotel (all thanks to the Internet), and hence moved to the cabin after Kankanadi. I enquired with the crew about this hotel - they did not have an idea, but suggested that I get off at PVS Circle and hire an auto. I remained in the cabin itself. On the way, the bus stopped to drop some parcels and finally dropped me at PVS Circle, at 0553hrs. The first auto guy wasn't very interested when he heard my location, but the second guy agreed to ferry me to the hotel (which was actually at a walking distance) for a small sum. This was my first time in Durgamba - and I liked it, to be honest. Absolutely no-nonsense service, very sleep friendly and very very polite crew. They were perfectly on time at either ends as well. The bus was clean inside-out. The bus was about 2 years old, and had logged about 4.85 Lakh kms. The overall maintenance was good - the bus did emit some noise from the rear suspension - can't really complain since the bus runs through some awful roads. I am sure to try them again when I travel to Mangalore again. Will I take this service again? Absolutely. Also, Good to see a post about a bus journey after a long long time. Hope next would be EKM Airavat Diamond Class. Flying 'Smart' from Bom-Bay to Bangalore.. Flying the new feeling: Vistara to Bom-Bay! DASH from Mangalore to Bangalore!